Currently I’m in Sweden taking care of an old house in the countryside. It’s as beautiful and lovely as its sounds. In the garden there is rhubarb, stinging nettles and leeks. The strawberries are flowering which shows that there will be delicious and fresh treats to pick in a couple of weeks . 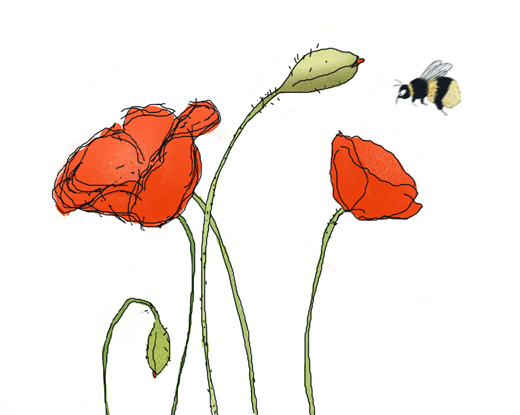 The deep red poppies are surrounded by bumblebees and the fish are jumping in the pond. This weekend I had some dear friends over for dinner. I had successfully baked sourdough bread which we enjoyed with dried sausage, aged goat cheese and olives while my friend Johan Kohnke prepared the rooks that was one of the sensations of the evening. The rooks are a delicacy similar to quail. In this part of Sweden there is an old tradition for farmers to hunt them as the birds often collect the seeds from the new seeded fields. Instead of just feeding them to the pigs, my friends and I had the pleasure to enjoy them with a creamy porcini mushroom sauce spiced with plenty of wine and herbs from the garden. For dessert my Sofi Meijling made a Cardamom Panna Cotta with a jam she cooked with freshly picked rhubarbs from my vegetable plot. The panna cotta was made with both heavy cream and Greek yogurt (about 50/50) which gave the pannacotta a slight sour flavor (see example of other panna cotta recipes below). Sofi used about one teaspoon crushed cardamom to flavor this evening’s final dish. This rhubarb jam was such a great reminder of how much I love having a vegetable garden. You don’t really need mush to make something so simply delicious. Melt the sugar in a pan together with the water and let it cook for awhile. Keep an eye on the sugar so it doesn’t burn and stir a little now and again. You may need to lower the heat to medium. 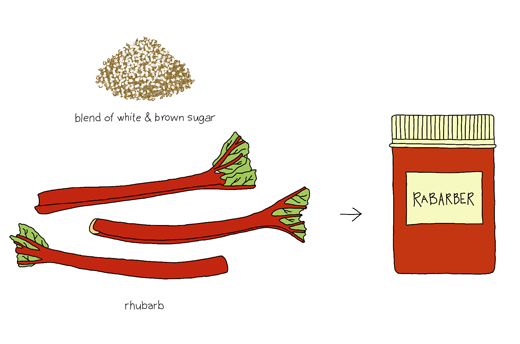 Clean the rhubarb and cut them into one inch long pieces. When the sugar is thick and sticky add the rhubarb and let them simmer until soft but not totally mushy. Set aside to cool before serving. If you think this jam is too simple you can spice it up with either ginger, cardamon or licorice root. The jam is also great together with aged cheese on bread but then I recommend you make a larger batch (just add more of everything). Jules Clancy makes Panna Cotta with Mascarpone and serves it with pot roasted pears. Ilva Beretta spices her Panna Cotta with lavender. This article was originally published at EcoSalon on 16 June 2012. The caramelised rhubarb jam sounds great. But I want to hear more about the rooks. Thanks Nevena. And its true it’s beautiful there! I am such a sucker for homemade jam…I just may have to try this!! As far as I know. It is rook-chickens beeing eaten in Skåne. Not grown-up birds. Here in Mälardalen (west Stockholm) no rooks can be found. That’s correct Örjan, they hunters shoot them when they are very very young. And they are most common in the south part of Skåne. Gästgiveriet in Hammenhög have rooks as one of their specialties on the menu. Not sure… But I think its when they are about to leave the nest in the beginning of the summer. I need to point out here that nobody should hunt this bird where it’s rare.